Situated in Nashville’s West End Neighborhood, Centennial Park is a lush oasis that offers a tranquil respite from the glittering lights of Lower Broadway, Music City’s Honk Tonk Highway. One of the most beloved parks in town, this gorgeous natural setting occupies 132 acres. The site has served as a fairground, a racetrack and the location for the 1897 Tennessee Centennial and International Exposition. The recreation area welcomes visitors of all ages with a variety of attractions and activities. The park was originally farmland owned by Anne Robertson Cockrill, the sister of James Robertson, one of the Fathers of Middle Tennessee. She acquired the property through a land grant for her heroic efforts to defend Fort Nashborough during an attack by Native American warriors. While wounded, she led a “bucket brigade” of women who threw pots of boiling water on the men who were trying to set the fort on fire. Her actions helped to save the settlement and several families who had recently moved to the area. Cockrill was also the first schoolteacher in Tennessee. A full-scale replica of the ancient Greek temple, the Parthenon was built for the centennial exposition. Once threatened with demolition, the building was restored in 1931 and remains the centerpiece of the park. It was constructed to celebrate Nashville as the “Athens of the South.” The edifice serves as a testament for what has been called the height of classical architecture. The building’s pediments are cast models of relics dating from 438 B.C.E. that are currently located in the British Museum. The historic structure houses a museum where visitors can view permanent and traveling works of art. The focus of the collection is a group of 63 paintings by 19th- and 20th-century artists. The Parthenon is also the location for a massive statue of the Greek goddess Athena. The work of Nashville-native Alan LeQuire, the 42-foot-tall ornate statue is the tallest indoor sculpture in the Western Hemisphere. The original plain white statue was unveiled after eight years of work in 1990. The gold leaf and other ornamentation that make the sculpture appear more like the ancient original was added 12 years later. The female figure holds a life-size statue of Nike in her upturned right palm to give visitors a sense of scale. The sculpture also features other subjects from Greek mythology, such as Zeus, Apollo and Poseidon along with the serpent-haired Medusa. The park includes a sunken garden for quiet meditation as well as a one-mile-long multipurpose trail around Lake Watauga, a man-made pond featuring water fountains, ducks and other aquatic creatures. The Centennial Dog Park is divided into areas for large and small breeds. Visitors can also enjoy the volleyball courts and children’s playground equipment. The park band shell is the setting for children’s theater performances, summer concerts and outdoor movies along with Nashville’s Shakespeare in the Park program. Spread a blanket on the lawn, and enjoy a picnic meal while listening to music or watching a theatrical production. A portion of the prow from the USS Tennessee, which fought in the Spanish-American War, adorns the park’s original entrance on 25th Avenue North. There are also displays of a historic steam locomotive, Civil War-era cannons and an F-86 Sabre, a Korean War Air Force fighter jet. In addition to signs explaining the history and significance of the park, various trees feature plaques with QR codes that enable smartphones to play stories and songs by Nashville artists about the plants and foliage. Centennial Park hosts a variety of cultural festivals throughout the year, including the annual Earth Day Celebration and the Tennessee Craft Fair, which feature food and music as well as family friendly games, activities and hands-on demonstrations. Music Corner is a series of free outdoor concerts held on Saturdays in the spring and fall on the lawn in Centennial Park. Old Town Trolley is a convenient way to explore Centennial Park while maximizing your vacation time. Visit the statue of Athena at the iconic Parthenon, or have a relaxing day around the open space of the park. With stops throughout Nashville, you can hop on and off at the sites you want to visit and learn about the rest during our fully narrated 90 minute historic sightseeing tour. Find the lowest price and money-saying packages by purchasing tickets direct through our website. Listed as a national arboretum, the Vanderbilt University campus preserves almost 200 different species of trees, shrubs and other plantings in a lush park-like setting surrounded by the city’s urban cityscape. The Bicentennial Oak dates from before the American Revolution. The campus is also home to several buildings listed on the National Historic Register, including the Old Gymnasium and the Mechanical Engineering Hall. A non-collecting fine arts museum, the Frist Center for the Visual Arts is housed in the historic nationally registered Old Post Office on Broadway that features a well-preserved Art Deco interior. The Frist Center hosts a number of traveling exhibits throughout the year and displays works by local and regional artists in a variety of media. The mission of the facility is to present a range of artistic styles to gallery visitors. A participant in Nashville’s First Saturday Art Walk program, the center also offers an architectural tour of the building. Repurposed into a luxury hotel, the Neo-Romanesque and Gothic-style Union Station still features many of its ornate architectural elements that highlighted the elegance of Victorian era turn-of-the-century train travel. You can see the soaring 65-foot-tall lobby with its barrel-vaulted stained glass ceiling and bas-relief sculptures as well as Italian marble and carved wood details. The building was designated a National Historic Landmark in 1977. Open from dawn until 11 p.m., the park’s main entrance is located at 2598 West End Avenue. There is free parking, and public restrooms are available. Although there are abundant shade trees around the park, it can hot sitting or playing on the expanse of lawn during the summer, so bring plenty of water. Spring and fall offer mild days and cool evenings with wide variations in temperatures. If you plan to visit during these seasons, remember to dress in layers. Because Nashville winter temperatures can hover near freezing, the park offers fewer activities during the colder months. Centennial Park is a featured stop on the Old Town Trolley Nashville tour. 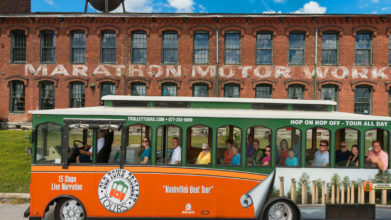 As you ride the trolley, the conductor provides a unique narration that includes intriguing facts and little-known anecdotes about Nashville and its most popular points of interest. While parking may not be an issue most days, the park can become crowded when it hosts a popular event. Be sure not to park on the grass. To avoid the hassle of trying to navigate traffic and locating a parking spot, ride the Old Town Trolley. With 15 stops and more than 100 attractions, including Centennial Park, the tour is one of the most convenient and comfortable ways to see Music City.